Well, 48 hours ago, I didn’t have any idea or any inclination that my hubby would be losing his job. We’re definitely not where we ever remotely anticipated we would be. His company had been doing lay-offs here and there, but somehow, we always felt “safe,” because his department hadn’t experienced any and seemed viable. You just never know. But, it happened 24 hours ago–our main income, our insurance, everything disappeared. We have options, but when the floor is taken out from under your feet, it’s hard not to find yourself sobbing and shaking and asking why. We’re starting to look at options, which has its good points (helps us to feel in control of our situation in some small measure, helps us to establish a game plan), but it’s difficult in others (trying to figure out insurance, realizing we might need unemployment or some sort of assistance for a while). I am terrified it will be months, even a year, before he finds another job. To be honest, I have heard from loved ones with good intentions who have told me, “Oh, it’s going to take such a long time for him to find work. There aren’t any jobs out there.” You know, that’s not what we need to hear. I need to look at this as our way out of our financial hole pre-job loss, and that it is our door to a better job and savings if we can find employment for him quickly. Maybe it’s false hope, but if we cave to “you’ll never find a job,” then we WON’T, you know? You don’t win by curling up in a ball in the fetal position on the playing field. I don’t know what will come of this. I’m angry. I’m scared. I’m still in shock. I never expected this, not really. At least we have my income from a brand new job, however small it is compared with the wages and the benefits from the job my husband lost. With this situation, we will be forced to change bad habits, will need to work together as a family, will need to assess wants/needs, and we will be wiser, less naive, less foolish. Maybe our family is just an expense that needed cut to a company, but I’ll be damned if I’m going to let bad luck and numbers win. Something good has to come from this, somehow. As I have mentioned before, our family has been struggling with debt. Lately, our checking account has been carrying a negative balance or has overdrafted more times than I care to admit. Combine our debt with few monetary resources, and things have been tight for us financially. Tight…suffocating…call it what you will. I have been trying to see the bright side of this situation. There are many blessings. My husband has a solid job that, unless there is a lay off, will be a sufficient income to live off of once we climb out of the hole that WE got ourselves into. Having less income to work with takes away a lot of the temptation to spend money because there isn’t anything to spend, which helps me to learn how to control those shopping impulses that I used to always give in to. We have been forced to live a more frugal and sustainable lifestyle as a result of our current situation. We are learning how to make more foods from scratch, how to preserve what we have, where to find the best prices when we do have to go to the store. We have been learning traditional skills like milling grains and canning. We have refocused our attention to our food storage and emergency preparedness. So, there are blessings underneath it all. And in some ways, we’re making some progress. I have a few underlying, ever constant goals–trying to eat out only once a week, if that, examining each and every purchase we make and whether it is a “want” or a “need,” tracking each expense, inventorying what we use in our food storage, daily finance talks. And I have adopted a new shopping strategy I want to share with you: First, try to find it for free. Second, search for deep discounts or bulk sales. Third, then contemplate retail price, and only then. In some ways, we’re doing well. We haven’t eaten out in three days. I have been tracking expenses and food usage during this pay cycle. We are growing our food storage–we have purchased more wheat berries for flour from a local organic farm, and we have been slowly adding #10 cans of staples to our pantry shelves. Tonight, hubby and I started our first in our series of daily finance talks, and I felt we were open and honest with each other, without any hostility or complaints. On the other hand, I still have my setbacks. I’ll share an experience with you. I went out today to look for free food grade buckets for wheat storage. I can find them in bakeries and grocery stores if I ask the right employees and departments. While out, I wanted to stop at Big Lots to see if I could find a detergent that an online cloth diaper group was commenting on that was cheap and effective for those of us who use traditional, “non cloth diaper safe,” detergents. I assumed I would buy a bag of it, and I was okay with that. I chose the smaller bag (a whopping $1.70), and was content with that, and I felt like it was a justifiable purchase. On the way to the next spot on our “bucket list” (haha), we then decided we wanted drinks. Okay, fine. Even though our account is in the hole, we had a few dollars of cash on hand. Drinks turned into cookies for the kids, which turned into a grill brush, which turned into chicken breasts and side dishes to cook. None of which we needed, might I add. $14 later, we left the store. On one hand, you’re probably thinking $14 isn’t a big deal. But when you’re in the hole, and only planned on one purchase, and the rest weren’t necessary or in the original idea, it is. It broke my “wants vs. needs” goals, and I’m not sure the feeling of defeat was worth it. Add cranky kids, and I felt pretty miserable this evening. We are making progress, and I’m not trying to sell myself short. Disappointed or not, we came home and discussed what happened. I still wrote down every expense. I shared my experience with others for accountability. But, I still expect more of myself. I still expect to win this, to conquer our goals, and to come out of the dark we are facing to the light at the end of the tunnel. I just sometimes feel very alone in this, like we’re the only ones who have to question $14. Even worse is the knowledge that we did this to ourselves…our income is sufficient. We simply overextended ourselves and created bad habits over the years. I know we’re not alone, but when you’re on this road, it’s sure a lonely feeling one, and a rough one to take. On Monday, I made a goal to “fast” from eating out for one whole week. I made it until Friday. I went to training at a new job that morning, and I was running late and skipped breakfast. Then after work, I had several errands to run. By 1:45pm, I was on the verge of hunger induced rage, and so I stopped at a local convenience store chain and bought some lunch and a drink. And in theory, I thought things would be okay. It was only one meal, right? And I had been working all morning and had a huge list of errands, and I needed to eat just this once, so doesn’t that make it okay? See, I noticed something. That “one time” eating out and the justification of it led to some results I hadn’t noticed before. Suddenly, I began justifying other things this weekend–those books the kids wanted at the discount store, the extra goodies at the local market, those eco-friendly dryer balls at the cloth diaper store, lunch with the kids today. This is what I refer to in my life as “having the spendies.” It’s like having the munchies, but instead of indulging on Cheetos and soda pop, it’s a dollar here, and five dollars there to fulfill a craving. I am realizing that this is perhaps my biggest financial vice. I get into these moods more often than I care to admit. And when money is tight, and we’re swimming in debt, there’s really only one conclusion to make: I have got to discover what my “triggers” are and how to control the impulse to nickle, dime, and justify. Anyone else fall victim to “the spendies?” What do you do to keep them in check? Yes, I felt the need to share. And we were out during dinner time, too, and I still waited until we were home to eat and made meatballs for dinner. So, in a Facebook group, we were discussing ways to save money, and in relation to my previous post, my friend Charissa suggested we “fast” from eating out for seven days. As I’ve mentioned in the past, eating out is one of my biggest financial vices, so it’s definitely going to be a challenge not to rely on the drive thru to get me through my stressful days. But, I think I can make it a week. Wish me luck! Prepare for a bit of a personal entry, but because I know I’m not the only one who has ever gone through this, I’m sharing this so, if you’re in a similar situation, you won’t feel so alone. For a while, we grew behind on our bills, even more than our traditional, always-a-few-weeks late status. We had a relatively new vehicle die unexpectedly, and there were a lot of costs associated with that. Our daughter was in the hospital for a weekend with a common illness gone bad. We’ve had other medical expenses. And, add to that the fact that we often have trouble curbing our unnecessary spending (especially me), and we ended up behind on bills. We’re talking months behind. And our creditors worked with us–to an extent. Most didn’t offer me what we really needed, and instead granted repayment plans where we needed to make double payments each month to catch up, which hit our budget. And I also followed my gut instincts and left a job due to personal stress and time constraints. And now, amid repayment plans and my just starting a new (part time) job, we’re massively “in the hole” when it comes to money. It’s embarrassing, really. In fact, it’s mortifying. We borrow from my in laws. We can’t get out of the gaping red hole. And I still struggle with the “I want’s” like wanting to eat out when life gets stressful, and I just don’t want to spend time slaving in the kitchen (or when I just want comfort food that I don’t have to make). Even when I feel I make an effort, something happens to put us right back into the financial mire. When my parents come into town and want to go out to lunch with us, they often end up paying because we don’t have it to spend. And that’s just bloody sad, really. I’m 30 years old, we have an income that SHOULD enable us to live a comfortable lifestyle, and Mommy and Daddy have to buy lunch. And I know I’m not alone. And I know that making financial missteps doesn’t make me a bad person. But doggone it, I really am ready for things to change. And I’m a bit discouraged because I feel like even if I do, sometimes, it just feels impossible. I look at others and sometimes feel like I’m the only one who really can’t spend any money. And what smarts the most is knowing that 90% of this is self inflicted. So, I’m sharing this for some accountability. I’m sharing this because there is no way to be self reliant when you are in debt. I’m sharing this for support, encouragement, tough love, whatever it is you want to call it. I’m sharing because this is a part of my journey. I’m sharing because I want to climb out of the hole. So, armed with a third of my normal grocery budget (for a span of two weeks, due to a temporary setback), my husband and I decided to utilize the local discount stores as much as possible. The area where we live is an odd mix, economically. There are some, like our family, who are lucky enough to have a spouse/partner/head of household with a good job, and even though we have our rough patches financially, we survive. And then there is the other end of the economic spectrum, where a significant portion of the area lives below the poverty level. It’s been bad enough to hit national news circuits. The ONLY perk to this situation is that the area abounds with inexpensive produce via local farms (the area is rural), and there are scads of discount grocers and scratch and dent stores. 1) Some products might be past their “Best By” dates. That is different than a “Use By” date. “Best Buy” is a bit more like a helpful suggestion…the quality might go down after the printed date, but it still might be fine to eat. This is a matter of personal preference, really. If I plan on using it right away, or its something I can store still for a month or so, like a mix, then it doesn’t bother me. We buy gum, in three packs, for 10 cents because it is past its suggested date, and it’s just fine. However, I’m leery of things like flour when they are past their prime. It’s a matter of preference. 2) If you’re like me, and you like a certain food niche, like organic food, or if you need gluten free, for example, then a scratch and dent grocer might have what you need at a fraction of the cost. Look for these niche items first. I find loads of organic foods, eco friendly cleaning products, etc. A lot of times, they are still in date, but because they are geared toward a smaller market, they don’t sell as fast as a store wants, so they get sent to a closeout or discount store, and you can snag it for mere cents off of the retail cost. 3) I admit, this is a personal preference, but I recommend steering clear as much as you can from dented cans and smashed boxes, per food safety reasons. 4) Look for paper goods in stores like this. We find diapers with cute prints (when we need disposables) for a fraction of the cost. Diaper companies circulate prints quickly, feminine hygiene companies are constantly advertising something new, same with toilet paper. And when the “new” becomes old, it gets sent to the discount stores. And, let’s be honest, paper doesn’t expire. Why NOT buy it? You’ll save big here. 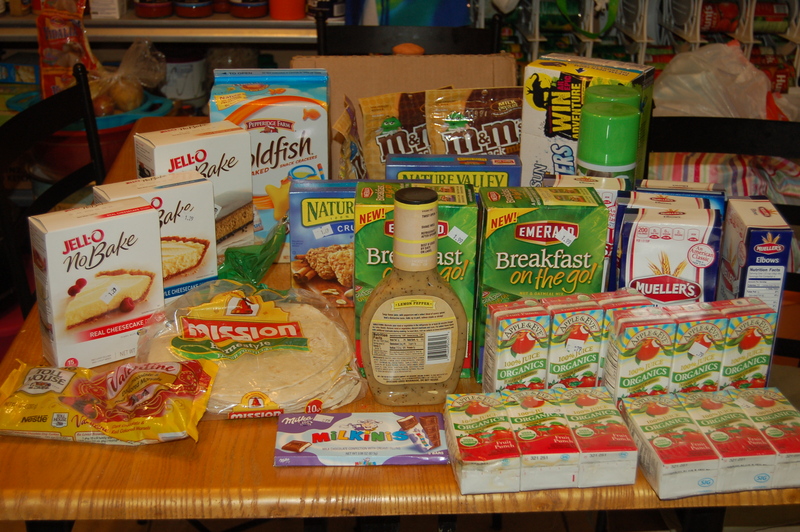 I went to two discount grocers today–and the photographed haul cost $34. Retail (this is an estimate based on past purchases) would be around $75, I would venture. Can’t beat it! With shopping at discount stores today, I spent $70 on everything we wanted for two weeks.